The Blue Jays made a few more cuts today, and, like pretty much all the others so far, none were unexpected. Despite a growing murmur amongst fans that Aaron Sanchez could be the answer to the Blue Jays’ pitching problems, Sanchez, who hasn’t pitched at all at a level above A-ball, was always going to start the year in Double-A New Hampshire. Getting reassigned to minor league camp, Sanchez is looking to build on a very solid big league spring training in which he didn’t give up a run in 12 1/3 innings. Sanchez is earning raves about his stuff from his teammates, coaches and his opposition but there are still things to work on. While scouts are saying that his control has improved and that his mechanics are looking better, Sanchez still walked six batters in his Grapefruit League innings and was throwing more balls than strikes at times. Sanchez may always be an arm that can be “effectively wild,” mostly due to the incredible amount of movement that he gets on his pitches but he is going to have to find the strike zone more often than not. The other concern, one that has cropped up a more in the last 12 months, is that he only struck out eight batters in his 12 1/3 Grapefruit League innings. The concern is not that his stuff isn’t major league quality but the way that it plays thanks to his lack of control and command. His strikeout rate has fallen as he has moved up from Class-A Lansing as he tries to pitch more to contact. That said, it may also be that more experienced hitters are able to lay off his nasty pitches when so many are missing their mark. I would expect to see both a a drop in walk rate and an increase in strikeout rate when Sanchez finds some better control. Kevin Pillar heading back to the minor league camp was also expected. With a glut of outfielders ahead of him on the depth chart, Pillar was tabbed to start the season in Buffalo right from the outset of spring training. 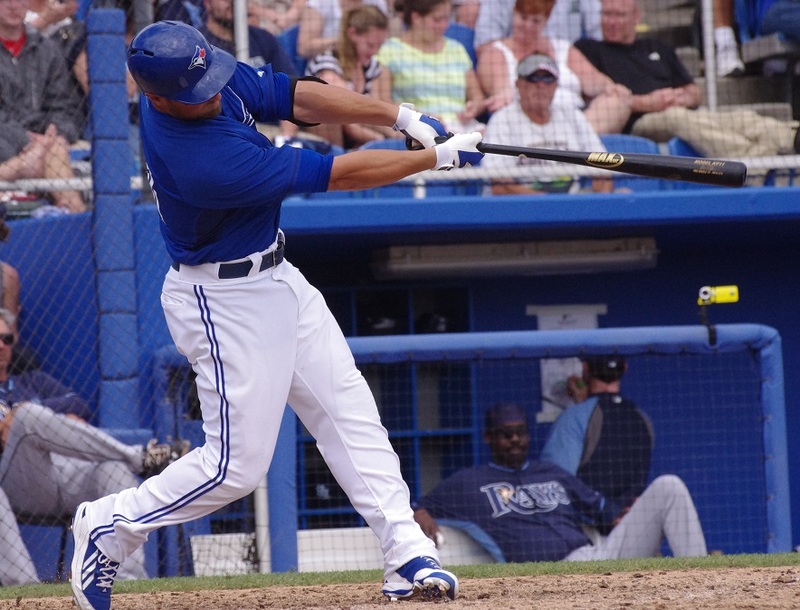 Despite only hitting .152 in 34 Grapefruit League plate appearances, Pillar did start to come on towards the end, looking more comfortable at the plate and hitting the ball with more authority. That said, Pillar didn’t take one walk this spring and has walked at rates that are well below average at every level above A-ball. His strikeout rates also climbed above Double-A and so I’m interested to see if he can turn those trends around with (likely) a full season in Buffalo in 2014. Dan Johnson, a non-roster invitee, had a great spring and was probably the most likely of the three to crack the big league roster. Despite a .360 batting average and three home runs, Johnson doesn’t have the positional flexibility that the Blue Jays are looking to have on what will likely be a limited bench (assuming the Jays carry eight relievers). Johnson is also a left-handed hitter which wouldn’t complement Adam Lind’s left-handed bat at first base/DH. The pickup of Matt Tuiasosopo also makes Johnson the one to go to the minors. Don’t forget about The 2014 Toronto Blue Jays Minor League Handbook, available March 31 as an ebook at Smashwords.com, Amazon, Apple iBooks, Kobo and other fine retailers for $7.99. Pre-order information coming soon! You can also preview the book at our Smashwords.com page!